Frederick and Samuel are entities with two very different approaches to immortality. 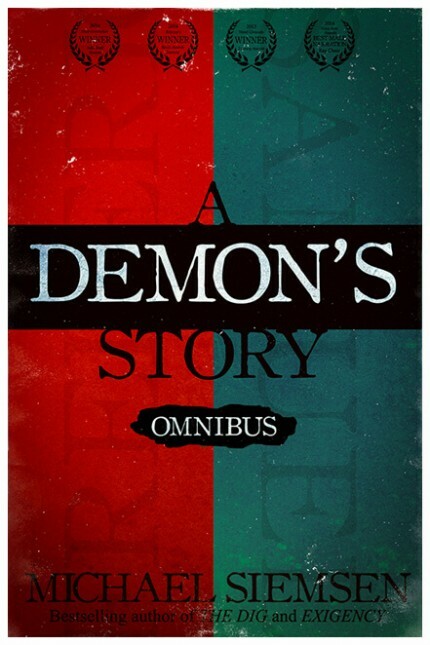 A Demon’s Story Omnibus: Books 1 and 2 of the acclaimed, award winning series, A Demon’s Story, now joined in a single Omnibus Edition. Frederick is a demon living life to the fullest…except, it’s other people’s lives. His name’s Frederick, he takes over bodies, and he doesn’t give a [poop] what you think of him, or so he claims. For every boast of his unforgivable acts, redeeming qualities never seem too far behind. Frederick’s a loner (he’s the only demon he’s ever met), and though the past thirty years of aimless debauchery—swapping bodies at will—have been more than a little enjoyable, he feels compelled toward a change of pace. He wants a warm place to call home for a time, and a woman to settle down with. Returning to Maryland, the place of his “birth”, Frederick has no trouble finding what he seeks, but fate appears disinclined to pardon a lifetime of wickedness. Though our antihero finds love, he’s also confronted by an adversary who appears to know more about Frederick than he knows himself.